Long time no see! It’s been a while since I finished anything, so it’s good to be back with another update. 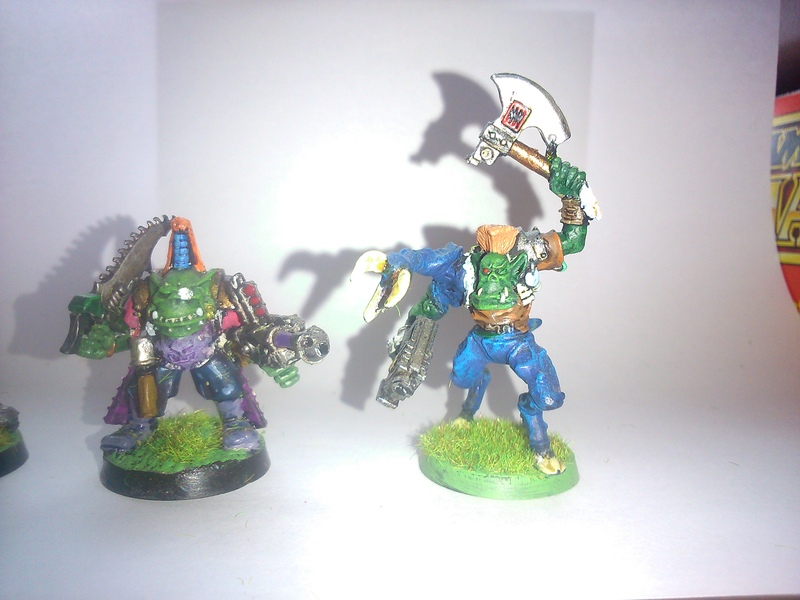 Once again I’ve finished another mob for my Ork Freebooter army. 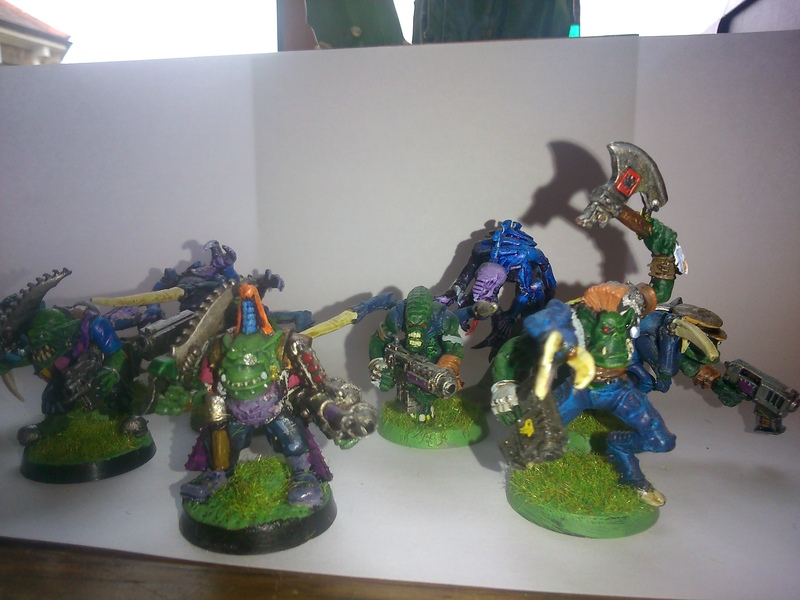 I’ve now got 5 Freebooter mobs and a big mob, so I really should paint a warboss and retinue so as to have a complete game-legal army ready to play with. This bunch took me longer than I expected, not least because I did it properly. 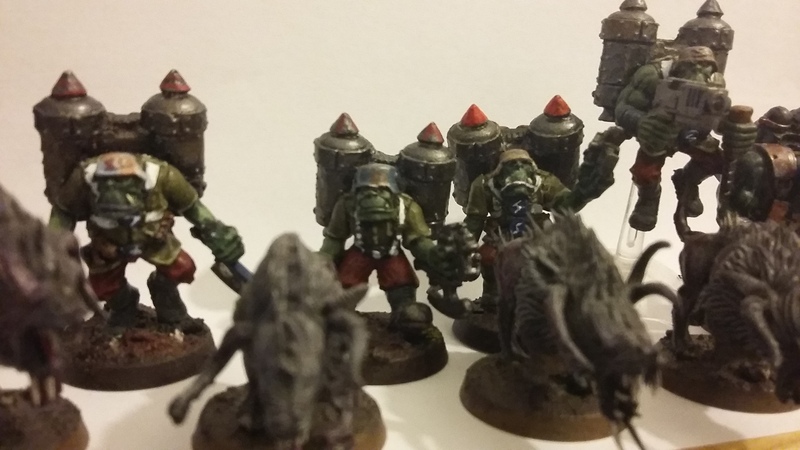 Having decided to paint some Stormboyz and picked the minis, I then chose the weapons load-out. Giving them all bolt-pistols and hand weapons seemed a no-brainer, after all they were going to be assault troops. Curiously, you still need to take a boy with a heavy weapon, even when using jump packs, so I gave mine an heavy plasma gun because it seemed like the coolest Orkiest thing to do. Heavy plasma gun and jump-pack! You can see below how I modelled it. Then I gave the nob a roll on the assault weapons chart and got a power glove. Rolled for some stikkbomz, because the nob had one modelled onto him. Then I rolled for chaos rewards. D4 + 1… 5 gifts! I went to Slaves To Darkness and rolled 5 times on the rewards charts. 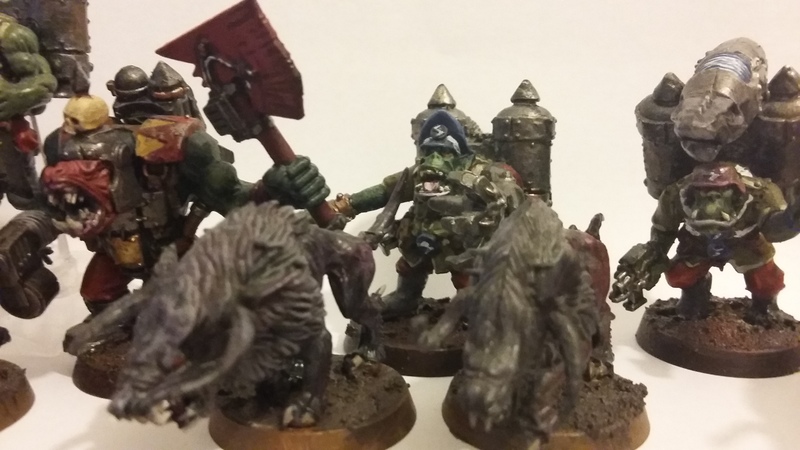 This is what I got: bestial face – flesh hound / dog; a pack of chaos hounds; gift of the gods – weapon hand; eye of the gods – chaos weapon (singing) + collar of khorne; aggression bonus (+1 ws, bs, s). Whew! This chap is quite the fighter. But now I had to model it! Lacking anything that remotely resembled chaos hounds, i ordered a box from GW. Khorne’s number is 8, there were ten in a box, so i had a spare to make a bestial face with. I scraped away the Nob’s face, then glued in the chaos hound’s muzzle. as you can see, i didn’t fill it in enough. I thought it would be alright when painted, but i needed more green stuff. It’s not a deal-breaker though. 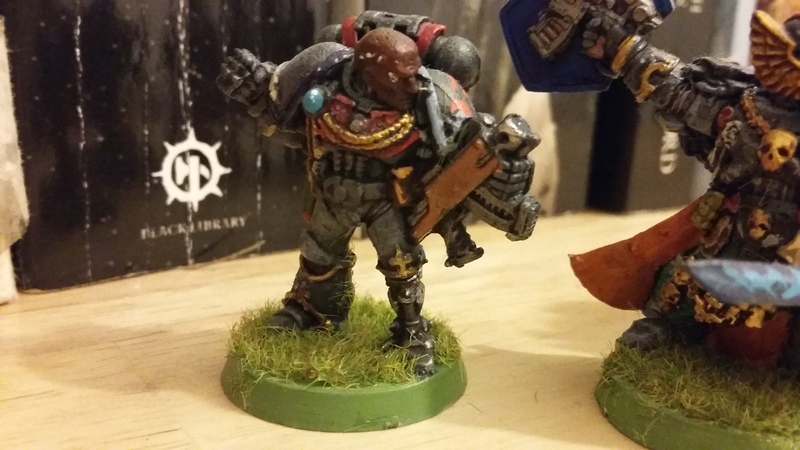 I decided to pass the power glove down to a lieutenant, as i couldn’t see a way of having a weapon hand, a chaos weapon, and a power glove on this model. If anyone complains that its not game legal I’ll say it’s a bionic arm and doesn’t have any game effect. I sawed the hand off the nob, then sawed part of the bolt pistol off, and glued the two together. Sorted! 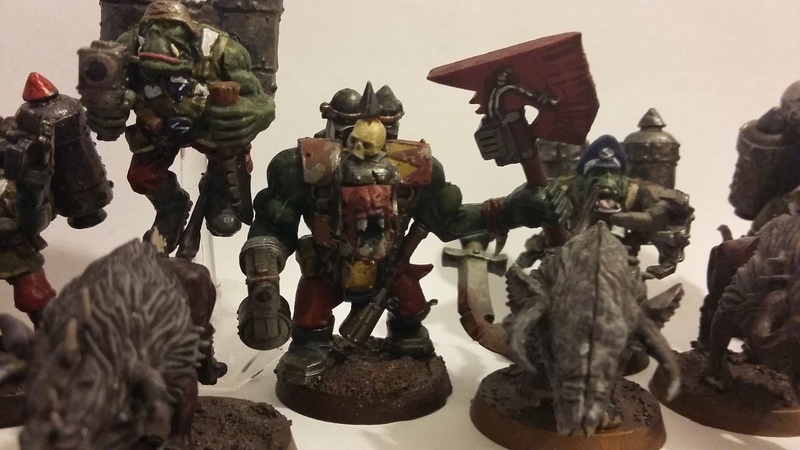 The power axe that the nob already carried could easily pass as an orky chaos weapon. I chose this nob because he was bigger than the other Orks. 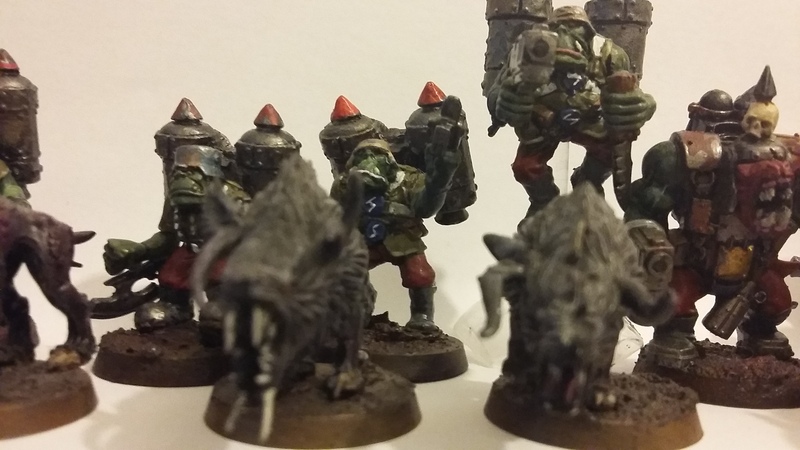 Mostly I’m not into the modern Orks, but these nobs (from Assault At Black Reach) work sometimesbecause they’re so big and muscly compared to the RT period Orks. He really comes across as a gnarled champion of Khorne. For the rest of the Stormboyz I was happy to use RT and 2nd Edition minis. 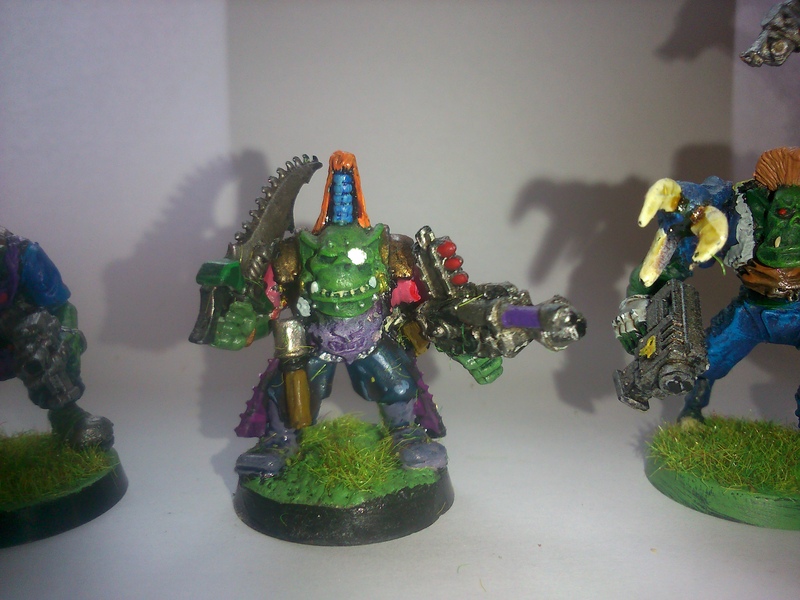 Normal Orks are a bit beserk, so it stands to reason that Khornate Stormboyz would be smartly dressed and uniform. I didn’t take a lot of time over the chaos hounds, just experimented with washes and drybrushing. Worked out OK, but I won’t be showing them off. 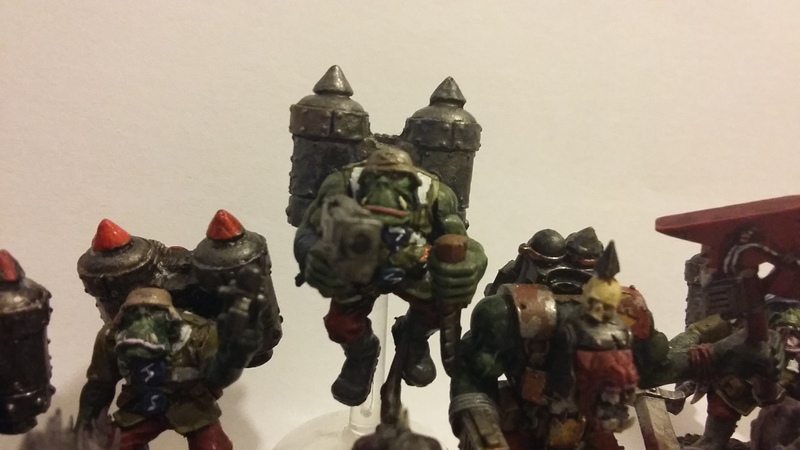 I’m a lot happier with the Orks. My painting skills are improving gradually and I think these are amongst the best I’ve ever done. I hope you enjoy them. 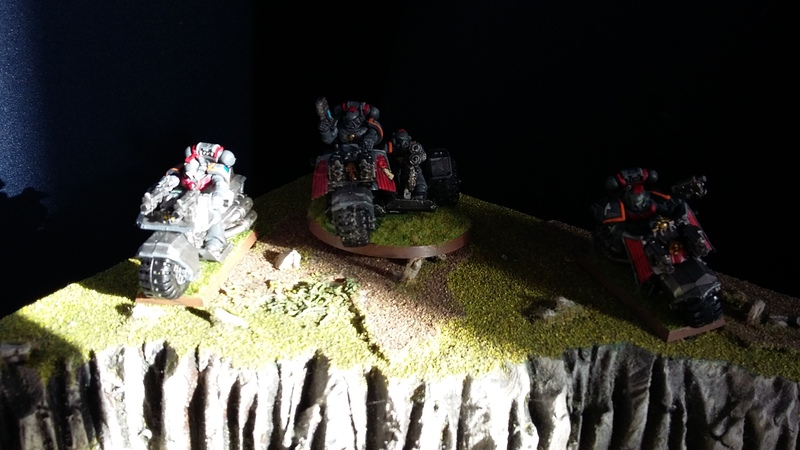 One muddy afternoon on a battlefield on a planet called Laroche, on the edge of the Coronid Deeps, a Mek called Wazguk and a Runtherd called Skumsol, met for the first time as they took shelter in a crater. 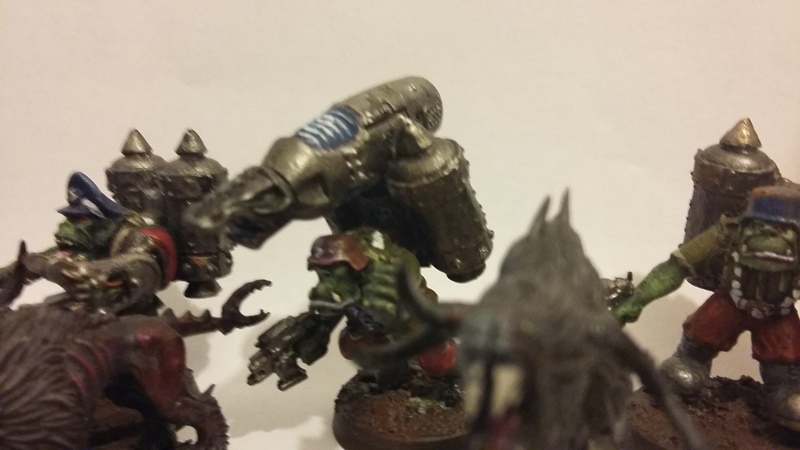 Wazguk complained that his Warboss wouldn’t let him use a Shokk Attack Gun. 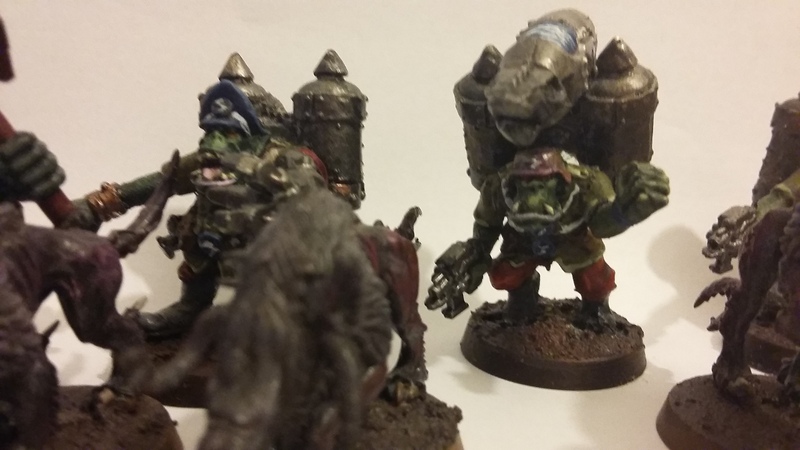 Skumsol complained that his Warboss wasted perfectly good Snottyz on mine clearance. At that moment an idea was born. Shortly after this the two of them said “sod dis lark” and nicked off with a shuttle, whatever raw materials they could pilfer, and a Painboy called Gutz who caught them nicking some bitz and fancied coming along for the ride. Since then Wazguk has been building artillery pieces, Skumsol has been breeding the bravest Snotlings he can, and Gutz has been trying to work out how to wire Grotz into a Dred. I’ve been working on these on and off for a few months now. I’m pretty pleased with them. 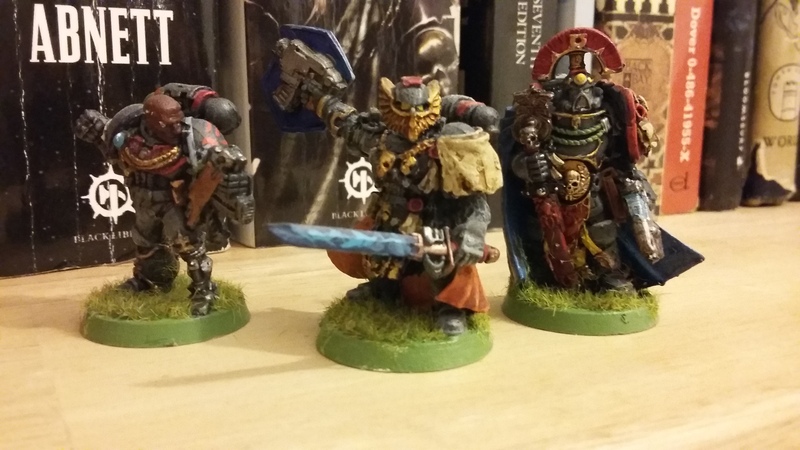 A nice mix of Oldhammer and Newhammer models that work well together. The biggest problem was painting Snotlings. I got so bored. 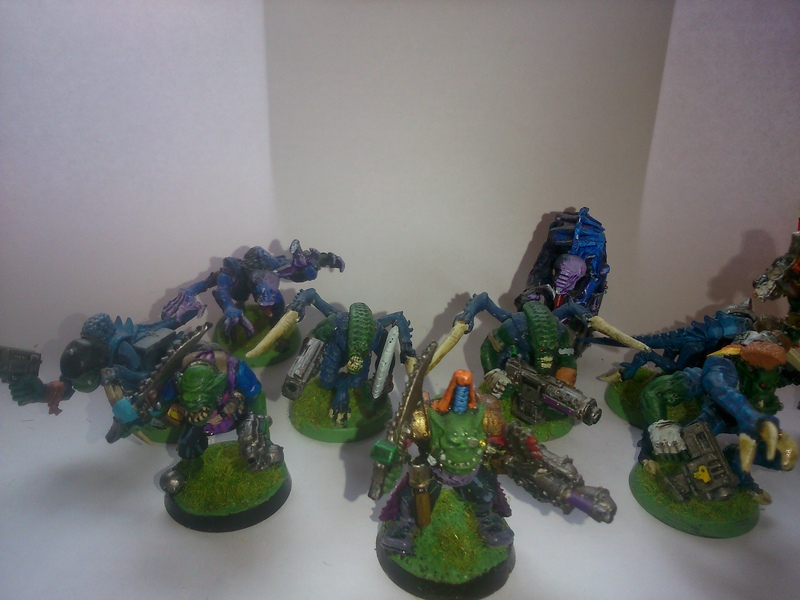 There were going to be 8 Snotling bases involved but after four, like the Oddboyz, I said sod dis lark. 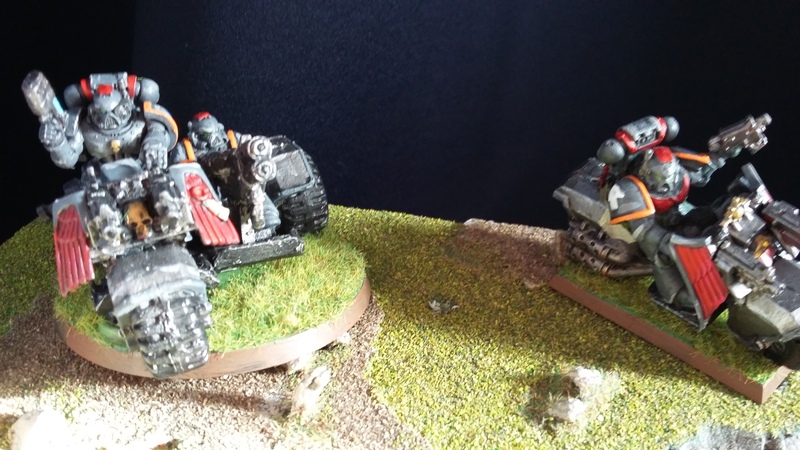 A few years ago, when I first started buying miniatures, I found something interesting in a job lot. It looked a bit like a Citadel Miniatures Mole Mortar, but upon examination it was actually homemade. What a good idea, I thought, and then forgot all about it for ages. Coming across it later I decided that the creator’s work should be honoured. It’s a good job, if a bit rough around the edges, I’m not sure I could make a better Mole Mortar myself. 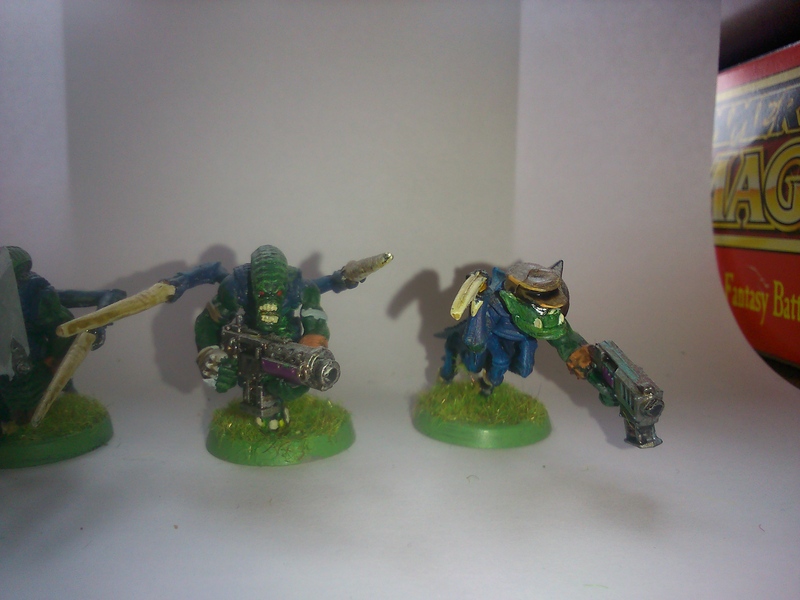 The original paintjob was a bit scuffed, but was suitably oldhammer friendly – with “death from below”, a winged bomb, and kill tallies painted on. I didn’t change anything, just added a bit of shadow, some green lines for the control panel screen, and some rough edge highlights. As I have lots of Chaos Cultists, it made sense that this was a repurposed Imperial mortar, and anyway, Cultists are always fun to make. These two are well along the Eightfold Path, mutation stealing away their humanity. I’ll leave it to the reader to identify the parts used. Finally I added some fencing to cover up the least convincing part of the Mole Mortar, and to make it look more like an artillery emplacement. 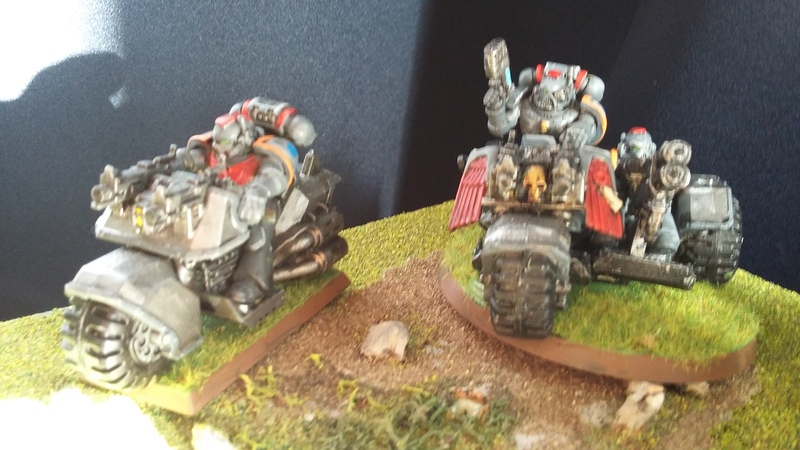 Those two had better hope no Space Marine sees them using that old helmet, or there might be trouble! I finished my Deadcember offering. Yes, yes, I know. 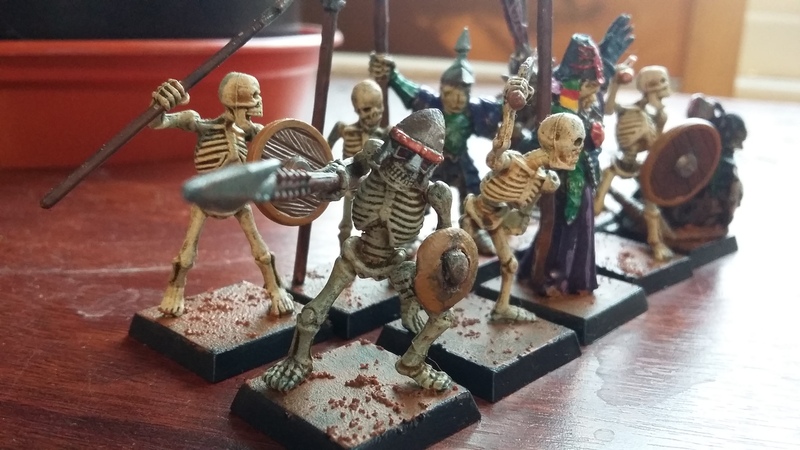 Undead are not my thing so it was hard enough to rustle up enough skellies to make up a unit. I had to build a couple of them out of broken ones! 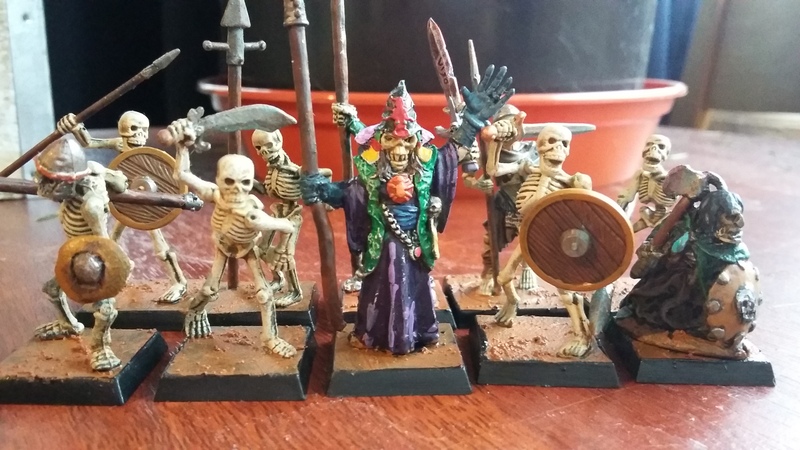 And whilst painting it I decided that the slotta base guy in the cloak… he’s probably not a skeleton at all. Anyone know who or what that mini is? The necromancer / lych / wight / whatever (anyone?) 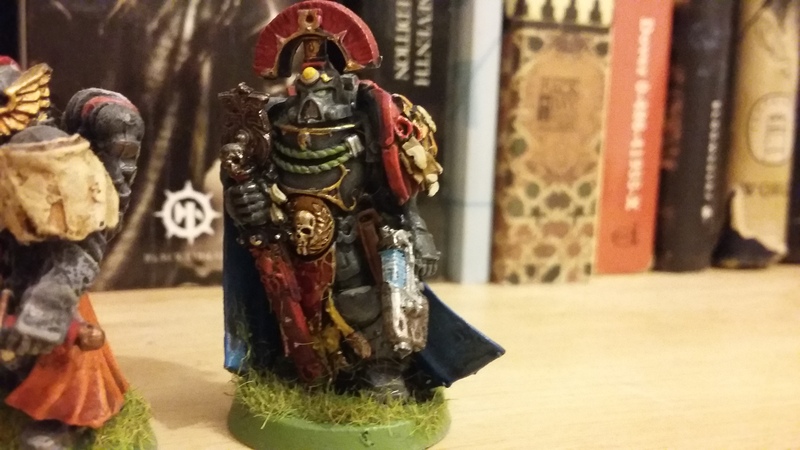 needed a new weapon and a new hand, and I think something has been cut off his hat. He’s wearing a comedy rasta hat version of the traditional pointy-hat because he’s a massively racist necromancer. 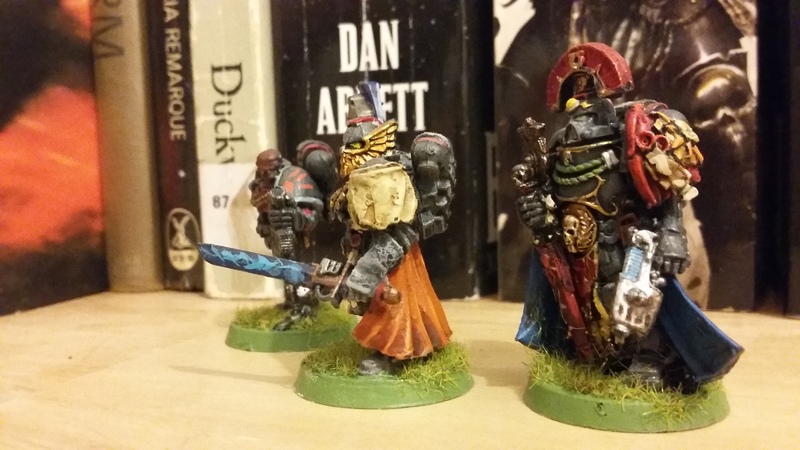 Another set of recently painted Space Marines I’ve had sitting on my shelf for a while. Apart from the eyes I’m pleased with these guys. The chap with the sword and shield was a mess, missing his hands, and being thickly coated with paint and glue. The chap with the bionic leg was one of the minis I really wanted when I was a kid, so it’s lovely to have gotten to paint him now. All in all I think these make a convincing and pleasing Honour Guard. 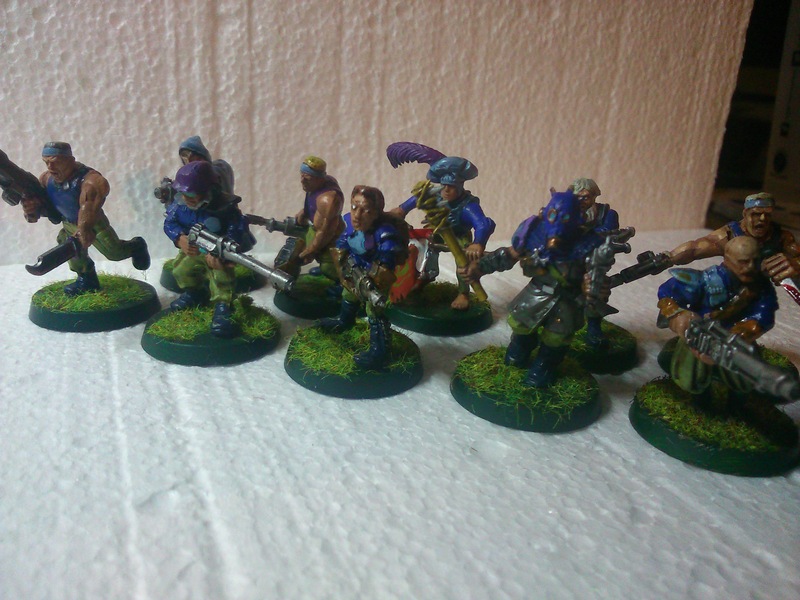 Right, finished basing this squad this evening. I’m not sure how successful this has been. 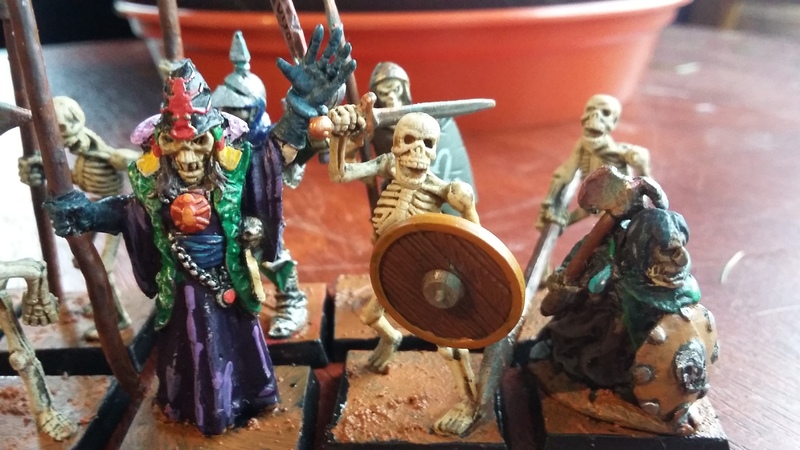 I’ve included WHFB and LOTR figures in this Cultists Squad, and tried to draw the styles together through a uniform colour scheme and spot colours. I think it’s OK, though the drummer with the plumed hat might be a step too far. Still, I think that a group of cultists during a Chaos Uprising could be mixed up, from all backgrounds and social classes and areas of the planet and with differing dress styles. Things I like about this. I love the two old models particularly. 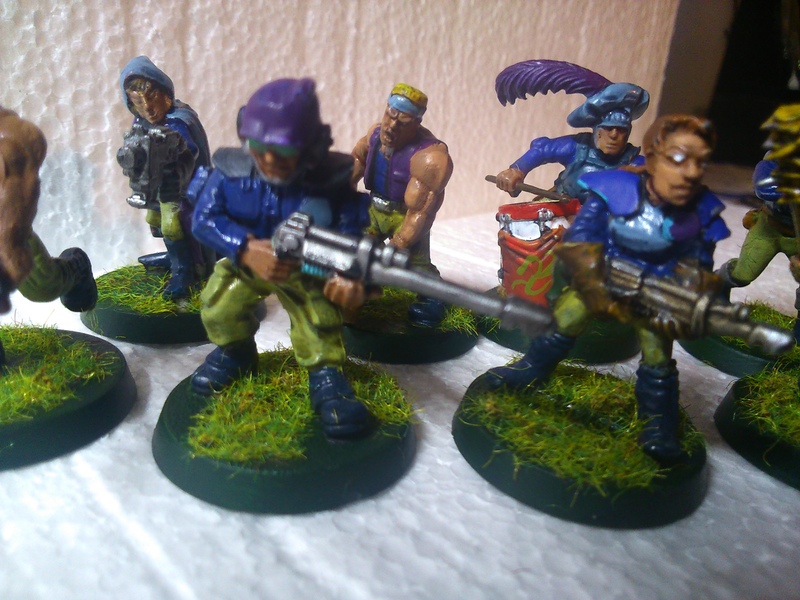 The old plastic guards are favourites of mine, and the female guard model is great. I like her mullet! I liked painting a crude Alpha Legion hydra on the drum. I like to think that these cultists are utterly deluded. They think they’re part of the gang, but they’re nothing but fodder, useful idiots. I like the harem pants wearing LOTR guy who looks like Lenin – I gave him a plastic Necromunda arm which I think workds. I’m getting better at green fatigues and caucasian skin painting. Still no good at eyes or hair! 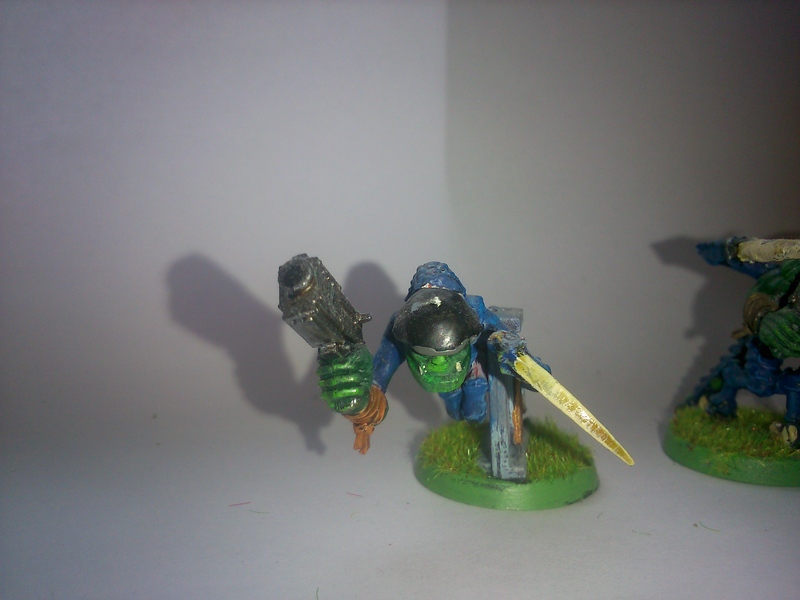 Old plastic guard and late 80s “female guard” models.